As a creative design and advertising agency, we’re always on the lookout for quality inspiration. Luckily, we are blessed to live in the same world as Tina Roth Eisenberg, a Swiss-born NYC designer better known as swissmiss, after her Twitter handle and the name of her immensely popular design blog. In addition to running her blog since 2005, she’s founded numerous successful ventures, including Creative Mornings, a monthly lecture series which now has chapters all over the world; FRIENDS (formerly Studiomates), a creative co-working space; TeuxDeux, a to-do app; and Tattly, a line of designer temporary tattoos. Oh, and did we mention she’s a mother of two? Tina is basically Wonder Woman. It’s not surprising, then, that when Tina delivers a talk, it’s packed with enough positive energy and enthusiasm to keep us feeling fired up for days. 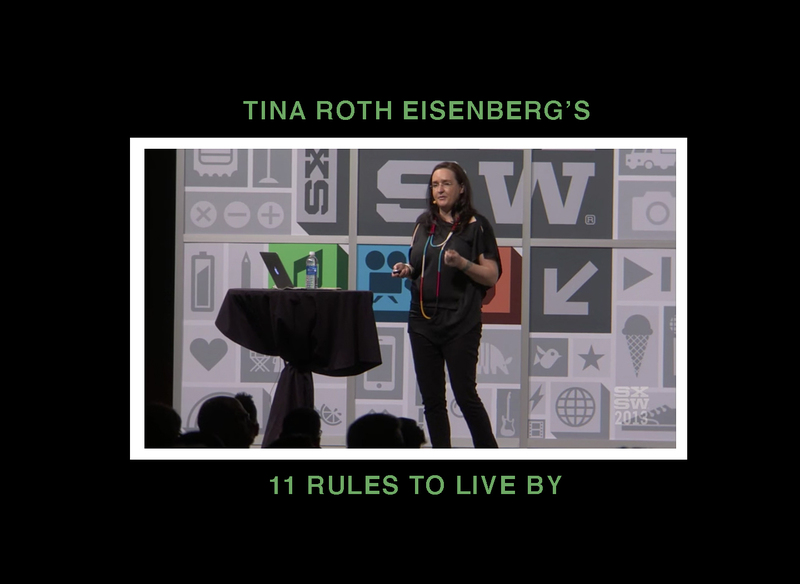 We recently revisited her Interactive Keynote at SXSW 2013, in which she shares how she found her way to success and fulfillment by following these 11 rules to live by. 1. Invest your life in what you love. Life’s too short to spend it doing something you’re not passionate about. Finding joy in what you do, whether it’s working with animals, raising children, or designing beautiful packaging, makes getting out of bed every day so much more worth it. When you’re chasing your dreams, even the challenges are less like obstacles and more like puzzles waiting to be solved. When you get ridiculously excited about something, that’s a major clue pointing toward what you find most important. Plus, gratitude is good for you, and celebrating life’s little victories is a surefire way to stay positive. 3. Don’t complain. Make things better. This rule is all about sharing responsibility with others. As creative types, it’s easy to want to control every single aspect of a project, to the point of overwhelming ourselves and becoming miserable. Tina advises us control freaks (raise your hands… yeah, us too) to delegate some tasks to others, and trust in their abilities to get them done right. Everybody wants to make it big, but a high-paying job isn’t everything. Sometimes doing what you love, even if it isn’t particularly lucrative, opens the door to financial success farther down the road. This means accepting the occasional pro-bono contract for that company you really admire, or maybe taking a job at a startup instead of a big corporation. “When things fall into place, it’s the universe telling you to keep going,” Tina says. 6. Surround yourself with likeminded people. Remember being in high school, when your parents were worried about you falling in with “the wrong crowd”? Turns out, they were right: when you hang around unmotivated people, you’re more likely to stay unmotivated yourself. Conversely, when you spend your time with people who share your goals—for us, creative individuals involved in design and advertising agencies—your talents will blossom. Check your ego at the door and make room for other people’s ideas. In Tina’s case, it led to the creation of the highly successful iPhone app, TeuxDeux. You never know what might happen if you collaborate! It could be magic. In the immortal words of 3LW, “Haters gonna hate.” Most likely, there’s going to be someone out there who thinks your time could be better spent than by following your bliss. You don’t need that kind of negativity in your life! Throw on some shades and wave buh-bye to that nonsense. 9. Make time to think and breathe. When you’re a driven, ambitious person, especially in a competitive industry like design, it can be hard to take some time for yourself. Even when you finally decide to take a mini-vacation over a long weekend, ignoring those mounting notifications on your smartphone can prove exceptionally difficult. Tina’s here to tell you, chill out. Take a break. You can’t be your best unless you give yourself time to relax. 10. If an opportunity scares you, take it. Sometimes the things that scare us the most are the things we absolutely must do. Quit that job you hate. Write a pitch to that brand you admire. Accept that invitation to give a keynote speech at SXSW. If you stay in your comfort zone forever, you’ll never give yourself the chance to grow. 11. Be someone’s eccentric aunt. In her hometown in Switzerland, Tina found some of her earliest inspiration by spending time with her aunt, a fashion designer and all-around creative. The experiences she shared with her aunt gave her the encouragement she needed to pursue her dream of becoming a designer. Be the eccentric aunt, and help someone realize their dreams can become reality. The best thing about these rules is that they can be applied to any part of your life, whether personal or professional. So, are you ready to conquer the world? We know we are!